The former Army staff sergeant convicted of killing his wife and a rookie Prince William County police officer three years ago was formally sentenced Thursday to multiple consecutive life sentences. Ronald Hamilton, who was convicted of capital murder in the killings of his wife, Crystal, and Officer Ashley Guindon, had initially faced the death penalty but a Virginia jury last year deadlocked on one of charges against him, triggering an automatic sentence of life in prison without parole. The judge, who decided on a total of seven consecutive life sentences in the two killings, could have imposed a lesser sentence than the jury recommendation or given Ronald Hamilton concurrent life sentences, in which they are served simultaneously, rather than one after the other. Hamilton was convicted of shooting his wife several times with a handgun after a heated argument about her attending a male dance revue with some of her girlfriends. The couple’s 11-year-old son was inside their Woodbridge, Virginia, house at the time of the February 2016 shooting. 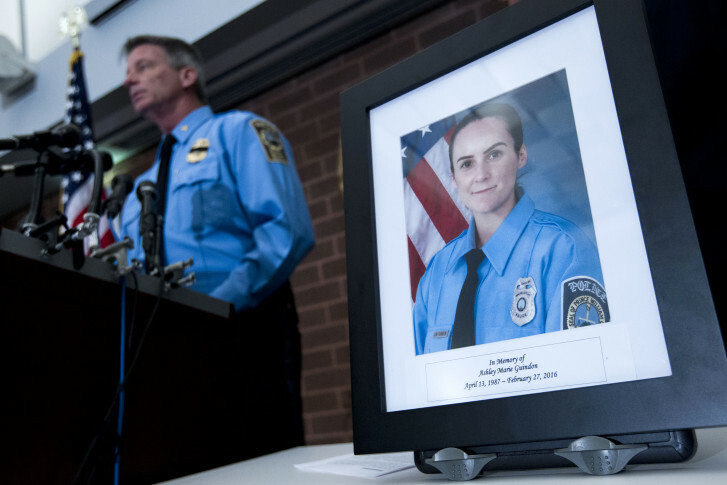 Then when police arrived and kicked down the front door, Hamilton opened fire with an AK-47, killing Guindon, who was on her first shift with the Prince William County Police Department. Hamilton also injured two other offices, Dave McKeown and Jesse Hempen. During the sentencing Thursday, dozens of family members of both victims filled the courtroom and emotions ran high. When she told the court, “He’s a coward, because he shot my child in the back,” Ronald Hamilton was seen wiping tears from his face. Murphy left the courtroom sobbing, supported by a deputy and her surviving daughter. Ronald Hamilton did not speak Thursday. Gene Hart, one of his lawyers, addressing the court on his behalf, said his client appreciates the statements that were made in court. He also referenced a letter sent to the judge ahead of the sentencing in which Ronald Hamilton apologized for the first time. In his letter, Hamilton said he hoped with time to gain forgiveness from his wife’s family and Guindon’s family. Hamilton was convicted last fall of 16 counts, and the jury recommended two life without parole sentences and five life sentences. Outside the courtroom, Prince William County State’s Attorney Paul Ebert said he respected the jury’s decision not to impose the death penalty but said he disagreed with it. WTOP’s Kristi King and Neal Augenstein contributed to this report.